Are you having trouble finding your perfect shade of Foundation? Lucy Minerals does CUSTOM BLENDS for a $3 charge. If after receiving your “Try It” Size Jars, you find you need a mixture of two of our shades, just order a Full Size Jar of Foundation in one of your shades and then make a note in the comment box with your shades and proportions. (Such as 1/2 Light and 1/2 Cream or 1/3 Creamy Bisque and 2/3 Light Medium). Please allow a few extra days for custom blends. Most of our customers find their perfect shade without having to do a custom blend, but we want everyone to know that custom blends are available. (This is only for a blend of Lucy Minerals shades. We cannot replicate shades from another company). When you are testing your shades, apply to your jaw line on clean skin. You want the Foundation to blend with your neck so it looks natural. Allow it to sit for about 10 minutes and then check it in natural light. If you find that you need a blend, make notes as you mix very small amounts of Foundation shades and test on your jaw line. You will need one shade that matches your complexion, and another shade that is a few shades lighter for Concealing. Lucy Minerals doesn’t offer a separate Concealer. You can get great coverage using our Foundation and a Concealer Brush. If you have dry skin around your eyes, just mix a teeny bit of Ambrosia Serum with your minerals to create a creamy concealer. 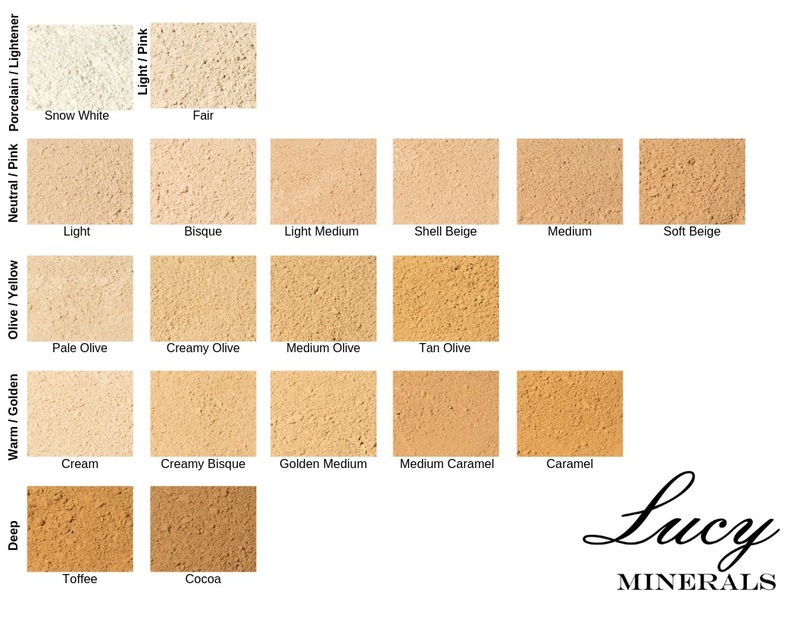 Here is a guide to the Lucy Minerals Foundation Shades. Snow White – Can be mixed with any shade to lighten it. Or some use it for highlighting. Fair is very light and a bit pink – think Nicole Kidman. Light, Bisque, Light Medium, Shell Beige, Medium, and Soft Beige are our neutral shades. I am of German heritage and have a bit of pink to my skin and this is the group of shades that I use. Many women are able to use these shades because they blend well with variety of skin tones. Pale Olive, Creamy Olive, Medium Olive and Tan Olive are soft olive shades. They aren’t as green as you would think. And sometimes if you have what you consider to be yellow-toned skin, the olive shades may work for you. Cream, Creamy Bisque, and Golden Medium, Medium Caramel and Caramel are our soft warm shades for golden skin tones. If you have red tones in your hair, there is a good chance these will work for you. But everyone is unique. It helps to look at the inside of your wrist to see if you have golden tones in your skin. Toffee and Cocoa are our darkest shades. These will work for many women with darker complexions and tend to darken a bit when they warm to the skin. So you can’t judge the color until it sits on the skin for about ten minutes. I listed each group of shades from the lightest to darkest. If you google “Lucy Minerals Swatches” you will find lots of swatches online to compare. I hope this is helpful! Please let me know if you have questions.